15 sizes/styles are now available, all are offered either in bulk or on tape & reel packaging which permits through-hole components to be placed simultaneously with surface mount parts on pick-&-place assembly lines - eliminating the need to hand place the receptacles in an additional manufacturing step. The OFP® barrier permits the sockets to be vacuum picked from the tape prior to placement in a hole in the circuit board. 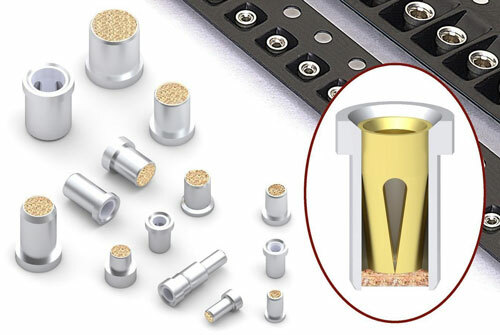 The OFP® receptacles are available assembled into strip sockets typically used to interconnect two or more circuit boards. The 834 (Single Row) and 835 (Double Row) Series Pass-Through Sockets have a low .130" (3,30 mm) profile and will accept ∅.030" (0,76 mm) round pin, as well as industry standard .025" (0,64 mm) square pin headers.